Why do we need to Refund? Refunding needs to be done when an order is cancelled or returned. Refunding an order also increases consumer confidence in your product and also helps you to win back your business through excellent customer service. The best customer for any business is the returning one. It shows that the customer is happy with both the service and the product. All small online retail business faces a major problem of building trust with consumers. Building trust and security doesn’t only apply to small and medium sized ecommerce stores, but also impacts big retailers to a very great extent. Nothing builds trust better than an awesome refund policy. And Shopify, does everything it can to ensure that consumers are happy with their purchase. Go to your Shopify Dashboard and click on “Orders” Page. Then navigate the order number that you want to refund and click on it. Note: The order to be refunded must be paid and fulfilled. Click on “Refund” in the order details section. 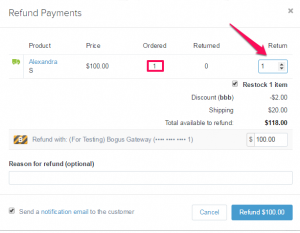 Select the quantity of order that needs to be refunded from the Return drop down. The quantity returned should be equal in number to the quantity ordered. If the customer has not yet returned the product or will not return the product due to damage or some other reasons, then uncheck the ”Restock Items”. This checkbox is only visible to track inventory for your product. Enter the amount of shipping cost, in case you want to refund the shipping amount to the customer. “Send a notification to the customer option” is checked by default, which will help sending a notification or email to the customer regarding the refund made. Click “Refund”, once you have completed the above steps.